Are digital media able to launch a revolution? 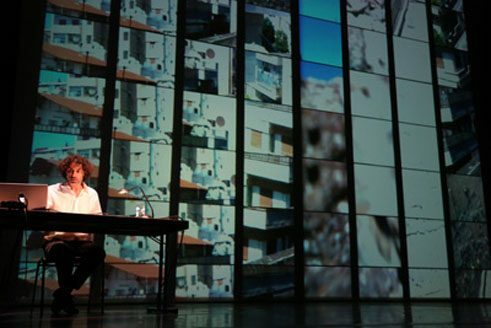 A conversation with the Lebanese artist Rabih Mroué about his lecture performance "The Pixelated Revolution", about information transfer, the treatment and the power of images in the digital era. Mr. Mroué, today, with the use of digital technology, reality is somehow depicted in cinematic ways: it is staged and seen through lenses or screens. In The Pixelated Revolution, you compare the videos of Syrian protesters with the avant-garde filmmaking movement Dogme 95 manifesto. How are they related? When I started to work with the videos of Syrian protesters, I found out that some of the activists were circulating instructions and advices on how to shoot a demonstration in a secure manner, such as “do not use tripods”, “do not take care of the quality of the images”, “do not shoot faces”, etc. I collected them and made a list out of it. To me, it looked like a kind of manifesto on how to make a film. In fact, this reminded me of the Danish Dogme 95 film manifesto, in which the filmmakers wanted to free themselves from mainstream dominance in order to create an alternative cinema, independent of the market, censorship or clichés. And, this in turn resembled in a way the principles of the protest movement and the aim of the protesters to free themselves from the Ba’ath regime. According to The Pixelated Revolution, the Syrian protesters were literally filming their own death. With this technologically mediated perception, can we still trust our senses? Is technology somehow becoming an extension of our bodies? Let’s put it like this: it is something related to adopting certain habits, such as getting used to seeing through something. The history of cinema gives us a good example: the first time spectators saw a screen with a train coming towards the lens, they thought that the train would come out of the screen, so they ran away, because they were not used to seeing a sequence of images that gave the impression of movement. The same happened with television and live broadcasting, at first it was also something new for us. We started to learn how to look at and understand these technologies. So, when the protesters use their mobile phones, put them in front of their eyes and look through the lens to see what is happening there, I believe the eye is not yet used to understanding what it is watching on that tiny screen in order to give the brain the signals to react immediately. This is why the protesters were not running away when they watched the gun aiming towards them. I think we should train ourselves to use technologies. It needs time. For me, „The Pixelated Revolution“ is somehow a “low-resolution revolution”. Do these shaky, blurred and uncut videos change their “value” once they are placed in museums or in other art related venues? Actually, the purpose of these videos was to report what was happening out there. In Syria, there was a lack of professional journalists at that time. Additionally, the regime was controlling the country very efficiently, so that it was very difficult for journalists to report from the side of the protesters. This is why everyone started to become a reporter. But, this immediately turned out to be a kind of resistance in itself. The videos were uploaded online, so that everyone could access and work with them. There was no signature, which means that they were meant to be for everybody. Even the regime started to use them against the protesters. For me, it was an invitation to work with this material. But, I realized that there is always a responsibility for how one uses it. As an artist, you have to think about what you will produce out of it, how you will present it and what kind of meaning do you want to get out of it. Of course, my intention was not at all to take these videos from the Internet and put them in institutions, like museums, for example. But, I have to admit that’s what happened. Initially, my intention was only to make a public presentation, like the non-academic lecture performance you have seen at UdK Berlin (University of the Arts) in October 2015. We have come to a point in which there are two sorts of images, the high- and the low-resolution images. At the beginning, it looked like there was a war between them, but in fact they have become complementary. Today, whether it is used in the arts, cinema or television, both types of images are used either way. In her essay “The Revolution Will Be Performed. Cameras and Mass Protests in the Perspective of Contemporary Art” Katarzyna Ruchel-Stockmans compares your work with Harun Farocki and Andrei Ujică's Videograms of a Revolution (1992), a documentary based on the Romanian Revolution in 1989, that portrays the first televised revolution. The Pixelated Revolution is a digital and virtual one, as it happens on the Internet. Is it possible today to do a real revolution via digital media? Al Jazeera did a programme on the Arab Spring that was called “Images until victory”, based on the slogan “Revolution until victory” of the Palestinian Revolution. For my lecture performance, I took Al Jazeera’s title and put a question mark at the end. It was to say that “No. Revolution can’t be done with images”. During the Romanian Revolution, people were occupying the state television studios and issuing declarations from there, as if they had occupied the whole country. What Farocki and Ujică showed us is how the revolutionaries were aware of the importance of television for the revolution. This is why they occupied the television studios and controlled the “air.” It was something symbolic, but it had a real impact on both the collapse of the regime and the mobilisation of people. For me, this can’t happen with the Internet. Digital data is so spread out, so dispersed, especially for the protesters. It is something that you cannot control. We can use it, but immediately the state power can re-appropriate it and use it against us. It is not like in a television studio, which is a physical thing, a building you can occupy. Digital material is full of surprises. Sometimes it is broken and you see only half of it, in other cases it freezes or it simply disappears. It is something virtual that you cannot grasp. It is fragile, rootless and lies somewhere in the cables. Portrait Rabih Mroué | Photo: Pascheit Spannend, © Gallery Sfeir-Semler Rabih Mroué (1967, Beirut) is an actor, director, playwright, visual artist, and a contributing editor of The Drama Review (TDR) and the quarterly Kalamon. He is also a co-founder and a board member of the Beirut Art Centre (BAC). 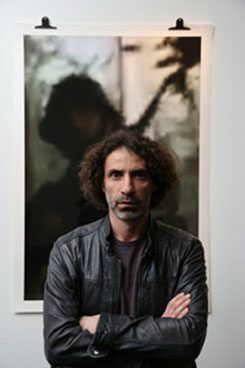 His works include Riding on a Cloud (2013), The Pixelated Revolution (2012), Photo-Romance (2009), The Inhabitants of Images (2008) and Who’s Afraid of Representation (2005). His work has been presented at MoMA, New York; HKW, Berlin; SALT, Istanbul; CA2M, Madrid; dOCUMENTA 13, Kassel; and BAK, Utrecht, among others. In 2010, he was awarded an Artist Grant for Theater/Performance Arts from the Foundation of Contemporary Arts 2010, New York and in 2011 he was the recipient of the Spalding Gray Award and the Prince Claus Award. He lives and works in Beirut and Berlin. The Pixelated Revolution has been performed at UdK Berlin (26. October 2015) as part of the Summer Academy KlangKunstBühne.